Description: This course provides an in-depth introduction to the theory and practical application of irregular silviculture in coniferous and broadleaved stands with the emphasis on lowland forests. The course is designed for 14 trainees and will be led by Andy Poore and David Pengelly and will incorporate a marking exercise followed by a review of the silvicultural and economic consequences of the marking. For more information see the flyer (PDF, 860 KB). Description: CCFG England plan to hold the 2018 meeting in the north after 3 years of meetings in the south and east of England. The group last visited this area in May 2000 and will plan to revisit some of the sites we looked at then. A write up of that visit can be found in the members section in the CCFG Newsletter 17, July 2000, pages 8-12. Description: The 2018 Pro Silva Annual Meeting will be held in Germany with field visits to Weimar, Eibenstock and the Erzgebirge mixed mountain forests and Beichlingen, Hatzfeldt and the ANW BioWild Project. CCFG usually sends one or two delegates to this meeting and assists with their funding. At present there are no spaces available, but there can be late cancellations. If you would be interested in attending if a space became available, please contact administrator@ccfg.org.uk for more information. Description: An opportunity to visit two estates working with CCF systems in Scots pine as well as some other species, to view the successes, discuss the silvicultural and financial challenges and to consider future options. Description: This visit is set in Southwest England and is being hosted by Tavistock Woodlands Estate. The day will give an in-depth look at the Bradford-Hutt system for transforming even-aged stands to continuous cover management. 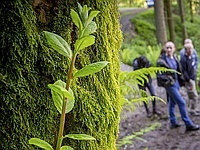 Description: Phil Morgan will host a visit to Coed Nant yr Eira, a 300-hectare forestry plantation in conversion to continuous cover lying between Llanerfyl and Talerddig in Powys. The transformation was started by Talis Kalnars in the 1990s. Challenging topography and ground conditions have resulted in a mosaic of small coupes in adaptive response to windblow, with ensuing issues of regeneration and light control. Some cleared areas have been re-stocked with an intimate planting pattern to match site types, and several stands are developing more irregular structures. A 2-day course covering the silvicultural principles of CCF management, designed for Foresters, Woodland Officers and Work Supervisors. This event will be delivered by Dr Jens-Uwe Haufe in Ruthin (North Wales), focusing on spruce and fir. We currently have a definite 3 places available to CCFG members. Contact us urgently to register your interest. Contact: For more information see the summary flyer for the course or contact Mandy at administrator@ccfg.org.uk. Description: This course provides an in-depth introduction to the theory and practical application of irregular silviculture in coniferous and broadleaved stands with the emphasis on lowland forests. The course is designed for 14 trainees and will be led by Andy Poore and David Pengelly and will incorporate a marking exercise followed by a review of the silvicultural and economic consequences of the marking. For more information see the flyer (PDF, 872 KB).